Yesterday I went with a few old high school friends to a Celebration of (Kimiko's) Life on the Island. Although I'm okay with death, it's hard to believe she is gone. Actually, to be honest, I just don't want to believe it. I could write page after page about how much I liked Kimiko and why. And all the things I remember about her. But I won't. Not here. Kimiko was diagnosed with ovarian cancer around 16 months ago. Everything happened so fast. These are two paintings I named after her. 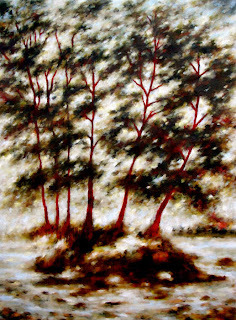 The second painting, the red one with the trees, is called Kimiko's Haida Gwaii. I found out yesterday that it was her husband Andrew (Andrew and I met on a trampoline at a Halloween party in 8th grade) who purchased the painting for Kimiko for Christmas. I found out when I turned over the ceremony schedule and saw it, reproduced on the back. Walter, Kimiko's brother, shared with me how Kimiko's Haida Gwaii had hung by Kimiko's bedside and that it had brought some comfort to him and Kimiko's family during this very difficult time. The first painting is called Kimiko Tree. I was painting the Kimiko Tree in my studio the day Kimiko died. Sunday, January 4th, 2010 at 12:12 in the afternoon. I had emailed Walter to ask about Kimiko, as I had not heard from Andrew in some time. I shared with him how Kimiko, Andrew and Kimiko's family had been on my mind so much in the studio that morning. A couple hours later, Walter replied. Kimiko had passed away four hours before. Painting that afternoon happened inside conscious intent: to surrender to anything Kimiko might like to do. I welcomed her spirit to paint, if she wanted to. This painting had been a struggle for so long. In no time, it soon came to life. I felt Kimiko playing, like a blissful child. Painless, ecstatic and free. The Kimiko Tree will live with Kimiko's family in Victoria, BC. It has been an honor and privilege to share in this very sacred transition in Kimiko's life. Kimiko gave us all her favorite quote to meditate on. I've been sitting with it a lot. I think I'm beginning to understand and like it. A lot. "The cost of hating others is loving yourself less." Happy travels, my friend. May you rest in Great natural Peace. This is beautiful Sheri. What an honour you've had to be a part of this transition. I too recently had a close friend pass away. This story is close to my heart and head-space right now. Thank you for writing this so sensitively. It brought peace to me today.